So I have been on a craft kick lately. It has been fun for the most part. I just hope Olivia hasn't heard to many of those four letter words that I only say when I am frustrated! 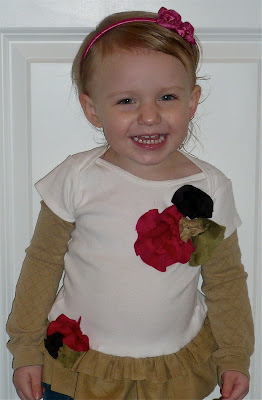 Anyway, I have been blog stalking so many crafty blogs out there, and have been inspired to make Olivia a shirt. And hopefully one for me too! So I was set out to do it and to do it for a very thirty price. Then I cut off the bottom of it and added a ruffle around the bottom. Then I added some flowers to the front, put on her arm warmers and Voilá! Here she is in her new shirt. Total cost of shirt re-make?? Oh my goodness! That just made my day! By far the cutest and cleverest thing I have seen made this year! I am very impressed Heather! Your purse was absolutely amazing also. I am definitely going to "try" to do a variation on this one, if you don't mind? Who do I make the copyright checks out to? You need to make a company name or something. BRAVO!! holy crap. you're amazing. I LOVE it! how can I make one? please tell me! Absolutely adorable...almost enough to make me wish I had a little girl to make one for...nah, I'm good! But way cute! So darling Heather! Love the shirt, love the purse, love your house! Keep sharing those projects and inspiring the rest of us! You're so talented Heather. Your projects always turn out absolutely adorable. You inspired me to START putting up a few things on the walls of our house and actually pounding in my own nails - that's about as daring as I get :). I love Olivia's ruffled shirt and arm warmers!